Eragon finds a strange blue stone in the woods. It turns out it’s a dragon’s egg and soon a blue dragon hatches from it. The dragon marks Eragon as a future rider as they bond together. After the king’s men learn about the dragon’s egg, Eragon and the dragon, Saphira, must run and hide in the forest. Brom, the village’s storyteller joins them on their journey. Eragon becomes the only other dragon rider besides the king. Brom teaches him about magic and sword fighting and dragons as they travel Alagaësia. On their path to stop king’s men and slay them, Brom dies after the trio is saved by a stranger Murtagh. Murtagh becomes Eragon’s new companion and they travel to the city Gil’ead to find information on how to find the Varden, a group of rebels who want to see the downfall of the evil king. While traveling, Eragon gets imprisoned by king’s men and there he meets the elf Arya that was the warden of his dragon’s egg. He rescues the girl and together they flee to the Varden. They are being followed and just before they reach the Varden, there is a fight with the Urgals, whom they defeat with Varden’s help. Final battle inside Tronjheim – Varden’s city – follows as Arya’s attackers follow them. Eragon and the Varden prevail with help from Saphira and Arya but Eragon gets gravely injured. First we meet shadow Durza who is following a dragon’s egg that was trusted upon an elf named Arya for safekeeping. She’s traveling with two others elves through the Spine with the dragon’s egg. The Shade – Durza – and Urgals kill the two male elves and capture Arya. Before she is captured, Arya magically transports a blue stone she was carrying so Durza cannot get it. Then we meet Eragon, a fifteen-year-old boy who lives with his uncle Garrow and cousin Roran on a farm near the village of Carvahall. While hunting in the Spine for supper, Eragon finds a blue stone. After failing to catch anything he tries to sell it for meat in the village but the stone is from the Spine and therfore believed to be dangerous. Weeks later the stone turns out to be a dragon egg and a blue baby dragon gets hatched from it. The dragon marks Eragon upon its birth and brands him for a dragon rider. Eragon brings the dragon up secretly in the forest near the farm. Dragon’s name is Saphira and she’s a blue female dragon growing at alarming speed. When the king learns about the dragon, he sends Ra’zac to hunt the dragon and the new rider down. They follow Eragon who hides in the Spine. When Ra’zac don’t find him, they burn down the farm and kill Eragon’s uncle. Eragon decides nothing is holding him in Carvahall anymore (since Roran left to earn some money) and he leaves with Saphira and a village’s storyteller Brom to seek vengeance. 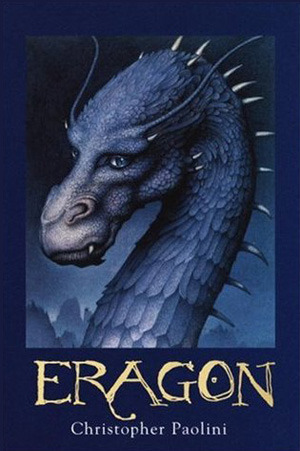 While traveling, Brom teaches Eragon about dragons, dragon riders, magic and ancient language. He gives Eragon a sword – Zar’roc – and teaches him sword-fighting as well. Their travels bring them to the city of Teirm, where they meet with Brom’s friend Jeod who provides some help about the king and his minions. Meanwhile Eragon’s fortune is told by the witch Angela, and her companion, the werecat Solembum, gives Eragon some mysterious advice. Eragon also keeps having dreams about an unknown woman. With Jeod’s help, they are able to track the Ra’zac to the southern city of Dras-Leona. Although they manage to infiltrate the city, Eragon encounters the Ra’zac in a cathedral and he and Brom are forced to flee. Later that night, their camp is ambushed by the Ra’zac. A stranger named Murtagh rescues them, but Brom is gravely injured and he dies. Murtagh becomes Eragon’s new companion and they travel to the city Gil’ead to find information on how to find the Varden, a group of rebels who want to see the downfall of Galbatorix – the king. While stopping near Gil’ead, Eragon is captured and imprisoned in the same jail that holds a woman he has been having dreams about – she turns out to be Arya, the elf captured by Durza. Murtagh and Saphira help and rescue Eragon and together they escape with the unconscious elf. During the escape, Eragon and Murtagh battle with the Shade. Murtagh shoots Durza between the eyes with an arrow, and the Shade disappears in a cloud of mist. After escaping, Eragon contacts the unconscious elf telepathically, and discovers that her name is Arya. She tells them that she was poisoned while in captivity and a potion found only with the Varden, the elves, and the King himself can cure her. Arya helps finding the way to the Varden’s whereabouts: a city called Tronjheim, which sits in the hollow mountain Farthen Dûr. She gives them only four days to reach the Varden or she will die. The group goes in search of the Varden. When they are traveling to the Varden they notice a unit of Urgals following them. The Urgals are revealed to actually be more dangerous Kull. Before reaching their destination, Murtagh reveals that he is Morzan’s son, who was the first and last of the Forsworn. The Kull reach Eragon right outside the Varden’s entrance, but are driven off with the help of the Varden. When the group arrives in Farthen Dûr, Eragon is led to the leader of the Varden, Ajihad. Ajihad imprisons Murtagh after he refuses to allow his mind to be read to determine if he is a friend or a foe to the Varden because of his background. Eragon also learns that Durza was not killed since the only way to kill a shade is stabbing it through the heart. Eragon meets with many important people inside Farthen Dûr, eats and sleeps there and trains as well while he is being tested by cured Arya and the Twins – powerful human magicians who claimed to support the Varden. Soon Farthen Dûr is invaded again. As the battle begins, the Varden fights against an enormous army of Urgals, deployed by Durza and Galbatorix. Even Murtagh is allowed to fight with the Varden. During the battle, Eragon faces Durza. Durza badly injures Eragon’s back with a cursed injury and is about to capture him when he is distracted by Saphira and Arya, who break a large star sapphire Isidar Mithrim on the chamber’s ceiling where the fight was happening. Durza’s attention is diverted long enough for Eragon to stab him in the heart with Zar’roc. After Durza’s death, the Urgals are released from a spell which had been placed on them, and begin to fight among themselves. The Varden takes advantage of this opportunity to make a counter-attack, forcing off the Urgals. While Eragon is unconscious, someone called ‘The Cripple Who Is Whole’ contacts him telepathically and tells Eragon to come to him for training in the forest of the elves, Du Weldenvarden.